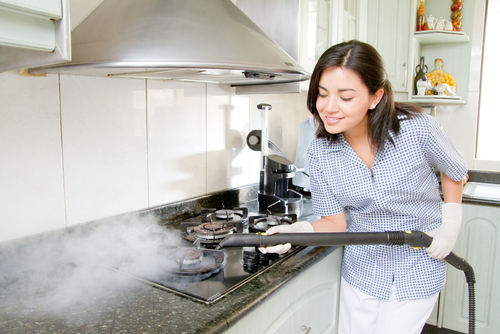 Steam cleaning systems are a revolution in whole-house cleaning. 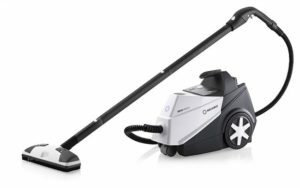 They’ve been popular in Europe for decades, and are now catching on here in the U.S. A canister system steam cleaner provides a balance between the versatility of a handheld steam cleaner and the coverage and convenience of a steam mop. You’ll be able to clean your floors with extra power, including all the cracks, crevices, and corners that you might miss with a mop. Plus, you’ll have an attachment set to use on pretty much anything you can think of around the house and in your car. There’s quite an overwhelming variety of options, so we know it can be pretty confusing to know where to start looking for the right one. That’s where we come in! As your steam cleaner experts, we’ve combed through the benefits and drawbacks of dozens of different cleaners, and read thousands of reviews from buyers like you. We narrowed down the options to find three great cleaning systems that will help you all over your house. Below, you’ll find full reviews of each of our top choices. We’ve explained all the key features, and boiled down online feedback from previous buyers to bring you everything you need to know about these cleaners. This McCullough system is one of the most popular cleaners available today. This is a heavy-duty cleaner that manages to fit right in your home. We love it for its versatility–we’re hard-pressed to think of anything you can’t clean with this machine. The best part is that it costs no more than a good steam mop! Previous buyers say they’ve gotten years of powerful service out of this machine. The heater in the McCullough is loaded with 1500 watts of power. That’s as good as it gets in this price range. The heater can get the tank up to full heat in 8 minutes. Once you’re at temperature, you’ll have enough capacity for 45 minutes of continuous cleaning. The trigger features a lock mechanism, which lets the machine produce continuous steam without you needing to hold your finger on the trigger. That’s a great feature for when you’re mopping. Of all the attachments, the jet nozzle provides the highest pressure and highest temperature. It’s great for blasting the toughest spots and sanitizing any surface. It’s also ideal for dealing with bedbugs. Reviewers loved it for sliding door tracks, faucets, windowsills, and other areas that are hard to reach with traditional cleaners. You have the option of using small bristle brushes or the larger scrubbing pad for other surfaces. That means you can use the small, intense attachments where you really need them, and then do the rest of the project more quickly with the larger pad. There are also a few types of brushes. The nylon bristles are good for grout, while the metal brush is strong enough to scrub grills and car parts. There are also two extension wands, so you can adjust the length of your attachments as needed. At full extension, it’s long enough to use comfortably as a mop, without having to bend over. The mop head is extra big, too, so you’ll be able to mop more quickly than you would with other mops. There are two mop pads included, which are good for any tile or wood surface. They’re microfiber, and are machine washable. 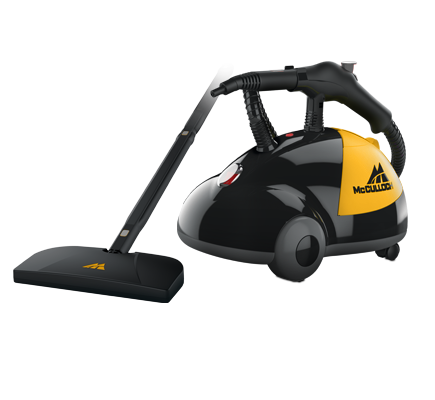 The McCullough also gives you a bit more coverage than many mops, with a 13×8.5” mop pad. The triangle brush helps you clean in corners, on flooring, counters and ovens. It’s compact. All the tools and the power cord can be stored onboard. The mop pads aren’t great for tile grout. We’d recommend cleaning the grout with a narrow nozzle before going over the rest of the floor. Also, you only get two pads, and they wear out quickly. There isn’t a fabric attachment. You can use the wide head, but you’d have to use the mop pad to prevent fabrics from being damaged. Obviously, such a wide tool isn’t ideal. Reviewers said it wasn’t really up to cleaning engines, as advertised. While it’s certainly powerful enough to handle most things around the house, McCullough’s advertising is a bit optimistic. This Reliable canister system is a powerful, efficient solution for whole-house cleaning. While its price is high, it’s a well-designed, highly durable machine that we think is truly impressive. Its sheer ease of use and smart design make it an absolute bargain. It’s a good choice for people who know they’ll get lots of use out of their steam cleaner system, and will appreciate the extra quality–without spending $1K+ on a Ladybug. It uses a pressurized system to provide consistent output at 58 psi. The heater is powered at 1780 watts, even more than the McCullough! It provides more than enough power for anything you can think of. Previous buyers raved about its effectiveness on food grease, adhesives, and paint spills, to name a few. There’s also enough power for tougher jobs like removing wallpaper and caulking. It takes nearly all the elbow grease out of redoing your walls or floors. Previous buyers said it makes light cleaning almost effortless, and really accelerates deep cleans. It’s also guaranteed to be 220 degrees at the tip, not just at the boiler. Many other machines have lower-temperature water, which dips below 220 degrees by the time it emerges. This can compromise a cleaner’s function as a sanitizer and a bedbug-killer. One especially smart feature is the automatic shutoff. If you’re in the middle of a tough cleaning job, you don’t want to have to keep eyeballing the water level. This handy function means you won’t accidentally damage the boiler by letting it run on empty. The boiler system has a lifetime warranty. Other parts are easy to order, and affordable to replace. Thankfully, the boiler is the costliest part–and you’ll never have to buy a new one! Overall, the build quality completely trumps its lower-priced competitors. The main hose is built from stainless steel, which won’t dent or break. The other parts and attachments are built from thicker, heavier plastic than many other cleaners. The hose detaches for storage. With flexible steam control, you can adjust it to your needs on any given day (anywhere from 0-58 psi). That’s a big advantage over the McCullough, which is a bit industrial for some delicate household surfaces. It’s a lot more expensive than some competitors. However, it’s the closest you’ll get to the power of an industrial cleaner in a household-sized package without spending a grand or two for a Ladybug. Plus, it balances its power with versatility and adaptive power. Some reviewers questioned how hot the water was when using both extension wands. The power cord is quite short, at only 10 feet. You’ll probably want to use the E3 with an extension cord. Because of the metal tank and wand, as well as the heavier plastic, the machine ends up being a bit heavier overall. It’s easy to roll around on the caster wheels, but it’s still a solid 20 pounds with an empty tank. The Steamfast is a lightweight, less heavy-duty version of the McCullough. It’s a very similar design, with fairly comparable function. We’ve provided it here as a slightly cheaper option for budget buyers. While we don’t recommend it for frequent use, it’s a good budget option for folks who want to be able to use steam once in a while without spending a premium. It comes with a big set of 17 attachments. It’s basically the same set that you get with the McCullough and the Reliable. There are a few basic brushes, extension wands, a mop head with pads, and a window squeegee. Our favorite attachment is unique to the Steamfast. It’s a corner tool, which can be outfitted with a sponge or scrubbers to clean into corners without scratching woodwork or grout. It’s the only corner attachment we’ve seen that isn’t hard plastic. It’s almost as powerful as the McCullough, with an on-par 1500-watt steam unit. However, it’s a bit gentler on home furnishings. The steam is less aggressive on delicate wood finishes, making this one a good choice for you if you want to clean your furniture more gently. It’s very lightweight, weighing in at just 8.5 pounds. It’s extremely inexpensive, and about the same price as the average steam mop. However, it covers even more ground. Reviewers loved it for a bargain-priced cleaning bundle, and we think it offers a lot of value for the price. The warranty is only for a year. However, customers generally had very good experiences with Steamfast customer service. It’s quite loud. The steam is “wetter” than some more expensive cleaners (i.e., less hot). This means you’ll have more residual moisture to wipe up. The cord doesn’t wind into the canister. This makes storage a bit awkward. There’s no attachment for cleaning fabrics or delicate upholstery. The plastic brushes warp under full power. You’ll be better off alternating steam and scrubbing, so the brushes don’t build up too much heat. Other plastic parts, like the wands, aren’t really up to heavy use. Our ultimate recommendation for a steam cleaner is the Ladybug. Specifically, we’re recommending the 2200S with TANCS. We think it’s the best balance of performance and value for the passionate homeowner who loves to clean with steam! While Ladybug systems are extremely expensive compared to others, they’re wildly better in terms of sanitation, cleaning, and residual moisture. We think this is the best thing on the market right now! It’s one of the only systems on the market to feature continuous steam! Continuous vapor systems allow you to top up the water tank before it’s empty, so you don’t have to take long intervals and wait for the whole thing to heat up again. The Ladybug can be refilled along the way, and heats up almost immediately. There’s no noticeable lag, so you can add water and keep on steaming! It’s also more powerful than the Reliable, or any of the other systems we recommend. The Ladybug’s boiler hits a whopping 290 degrees F, and it puts out steam at 60 psi. Careful readers will note that it smokes our other picks in both departments! The effect of having so much more pressure and heat is that your cleaning moves along much faster. You’ll get far more done, and use less elbow grease to do it. Another benefit of using the Ladybug is that you’re left with very little residual moisture. Since the steam is so hot, it mostly evaporates rather than pooling behind you. That’s why this is so good for grout, carpets, and other areas where mildew can be a problem. You can use it to disinfect and kill dust mites without worrying about moisture! This Ladybug features the company’s TANCS technology. It’s a chemical-free (made from nanocrystals) innovation which sanitizes as well as industrial chemicals! It’s actually EPA-listed as a disinfectant, even though it doesn’t contain any of the harmful chemicals usually used to sanitize. Between TANCS and the ultra-hot steam, the Ladybug sanitizes and kills pests (dust mites, bed bugs, etc) like a beast! You don’t have to hover for 15 seconds, like you would with a steam mop. It disinfects almost instantly. It comes with a 13-piece accessory set. Right out of the box, you’ll be well-equipped to clean all your floors, as well as lots of other household surfaces. The 2200S is also available in a number of different kits, so you can choose the toolkit that’s best for your home. Just follow the links above to see them all! It’s made in Italy and has a spotless reliability record. The only real downside of the Ladybug is the price. It costs many times what you’d pay for a Reliable, or any other midrange steam cleaner. This is only a purchase that makes sense for someone who’s going to do the majority of their cleaning projects using steam and will get their money’s worth. It also takes a bit longer to heat than the Reliable. That’s the trade-off of having a larger boiler, though! Which steam cleaner is right for you? The Reliable is ideal for people who expect to do most of their cleaning with steam. It’s not nearly as expensive as the Ladybug, but it still outperforms the McCullough and Steamfast by a long way. We think it’s the best choice for the average buyer. The McCullough is our recommendation for anyone who wants to spend less than $200. It’s extremely popular, so there’s quite a bit of feedback about it online–most of which is overwhelmingly positive. It’s very inexpensive, and will clean just about any surface well. Plus, it comes with a huge accessory set to help you with each job. However, it’s not as industrial as advertised, and it won’t last as long as the Reliable. 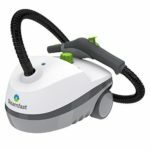 The Steamfast is our choice if you’re on a budget and will be using it for light household cleaning and the occasional deep-clean. Reviewers said it’s capable of cleaning most household messes, and is reasonably durable. However, since the McCullough is only slightly more expensive, we’d recommend spending a little more for a nicer machine. Finally, the Ladybug is our recommendation to those committed steam users who want the best of the best. There’s simply no competition between this thing and the rest of the market. It’s more powerful, more user-friendly, and more effective! Don’t buy this if you won’t get your money’s worth from it, though. More expensive steam cleaners are more powerful overall. They produce higher-temperature steam, which leaves less residual moisture. They also build up higher pressure in the boiler, so steam comes out with more force for cleaning. They’ll also have more complete attachment sets. Generally, these all include the same tools. However, cheap brushes don’t last long, nor do thin plastic hoses. Higher-quality machines will have better accessories in the package. You can also expect better durability from top-of-the-line cleaners. They’re built better, and backed by longer warranties. The price difference between the cheap ones and the decent ones isn’t huge ($100-200), but then there’s a big jump from decent to very good ($500+). Depending on your house and your other cleaning equipment, you’ll need different attachments. If you have grout, for instance, or want to clean a grill, you’ll need higher steam pressure and metal brushes. Make sure your steam cleaner will cover everything you need it to. It can be quite a long process to get a steam cleaner up and running, and it takes just as much time for it to cool down when you’re done. You’ll want to make a list of cleaning jobs before you start cleaning, so you’re not wasting any steam time. If there’s one obvious spot to clean, there’s probably a few more hiding just beneath eye level! While steam cleaners are meant to work on just about any surface, you will want to make sure the surface is intended to be steam cleaned. Check the warranty on your carpets and hardwoods before you start cleaning. You don’t want to void the warranty or cause unintended damage! It’s also a good idea to steam clean a small patch of a carpet or upholstery somewhere that’s hard to see. That way, if it changes the appearance of your furnishings, you won’t have ruined the whole thing. Some carpets may only need dry cleaning so know the difference between dry cleaning and steam cleaning. The vast majority of steam cleaners will recommend using distilled water in the manual. That might seem expensive, given the tank size on some of the larger canister models. However, this preserves boiler life by preventing mineral buildup and deposits. And you’re saving lots of money on cleaners and rags, so a few gallons of distilled water is a worthy investment. Steam cleaners can work wonders, but steam won’t do the whole job by itself. You should expect to do a bit of scrubbing work on tough jobs, even with the best steam cleaner. If a spot won’t come clean, hold the steam over it, then try wiping it away. You can also try alternating steam and scrubbing. This stops moisture from building up on the cleaning surface, and prevents the brushes from warping under constant heat. For more, be sure to read more of the best steam mop reviews!